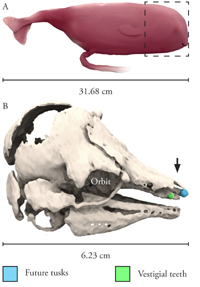 Computed tomography and digital three-dimensional imaging software were used to create a comprehensive visual record of the dental anatomy of the narwhal, Monodon monoceros. This multi-institutional study was conducted with cooperation between the Johns Hopkins Medical Institution (JHMI), Harvard University School of Dental Medicine, the Smithsonian Institution (SI), the National Aquarium in Baltimore, and scientists with Narwhal Tusk Research (NTR). Digital reconstructions provide an undisturbed view of the teeth in situ, and reveal anatomical information that has been inaccessible and undescribed in previous studies. This investigation produced novel information on the presence of paired vestigial teeth in the narwhal, and discovered developmental changes in the relative positions of the vestigial teeth to the tusks in the maxillae. Frozen specimens examined in this study included one male and one female complete head sectioned posteriorly at the occipital condyle, and a complete fresh female fetus. Results include images and descriptions of the teeth and associated bony structures. Figure 1. Taxonomy of the narwhal, M. monoceros. Figure 2. Anatomy of skull of adult female narwhal. (A) Dorsal, (B) lateral, and (C) ventral views. Figure 3. Dentition of fetal female narwhal. (A) Lateral view of complete fetus and (B) lateral view of skull and teeth; fetus four-six months in its development. Lateral view of fetus 3D surface model from CT. Figure 4. Migration of dental structures during development. (A) Dorsal fetal female and (B) adult female views; skulls rendered to same length of base. Rostrums are transparent for complete visualization of the teeth. Figure 5. Dentition of adult male narwhal. (A) Dorsal view of skull and teeth; left vestigial tooth is inferior to tusk, as shown in inset. Detail shows tuskal pulp cavity in erupted tusk. (B) Lateral view of male narwhal head with plane of section and coronal CT slice. Lateral view colorized 3D surface model from CT data. The narwhal, Monodon monoceros, is a coastal cetacean in the family Monodontidae (Figure 1). Narwhals have northern circumpolar distribution, and are rarely observed below 600N. longitude Males may grow up to 4.7m (15.42 f) in length and weigh 1600kg (3,527 lbs) (Heide-Jorgensen 2002). The most conspicuous characteristic of the male narwhal is its left tusk, which emerges horizontally through the maxilla and upper lip and can extend up to 3m (9.84 ft) beyond the head of the animal. The left tusk is straight and spirals counterclockwise in its long axis. The right tusk of the male typically remains embedded in the skull (Brear et al 1993). The paired tusks of the female narwhal usually remain embedded in the skull ( Roberge and Dunn 1990). The specimens that were used in this study exhibit dental anatomy that is representative of typical narwhals from a selected population. In addition to known dental structures, the imagery produced in this investigation identified paired vestigial teeth in all specimens examined in this study. This investigation was part of an ongoing project by Narwhal Tusk Research (NTR) to describe the dental and cranial anatomy of the narwhal. This study at the JHMI created a comprehensive record of the dental anatomy of M. monoceros in cooperation with NTR and Dr. Brent Whitaker, DVM, Deputy Director for Biological Programs at the National Aquarium in Baltimore. Narwhal Tusk Research (NTR) legally purchased, and transported, the two adult narwhal heads—one male and one female—from the Inuit in July 2004 during a field expedition to Pond Inlet, Baffin Island, Canada. The specimens were frozen and stored at Woods Hole, Massachusetts, until NTR transferred them to the large specimen freezer at the Smithsonian Institution National Museum of Natural History (SINMNH) in October 2005. On November 10, 2005, the frozen specimens were transported to Baltimore, Maryland for computed tomography (CT) at The Johns Hopkins Hospital (JHH) Russell H. Morgan Department of Radiology and Radiological Science. Harvard University also obtained one fetal female narwhal specimen, between four and six months in its development, from the Inuit during a field expedition in August 2005. The NTR immediately shipped the ice-packed fetal narwhal from the Arctic to Baltimore for CT at JHH. Following CT imaging, all of the specimens were returned to the SINMNH laboratory in Washington, D.C. With a secure understanding of the anatomy obtained from the CT images, a team dissected both adult heads at the SINMNH. Prior to the dissection, the data from radiography was used to create digital three-dimensional (3D) models of narwhal dental anatomy. The CT data collected in the Department of Radiology at JHH was conducted using a Siemens Medical Solutions Sensation Cardiac 64. This 64-slice scanner—optimized for cardiac, thoracic, and vascular imaging—generated 0.5mm-thick slices for each of the three specimens as follows: 2916 for the male, 1460 for the female, and 2500 for the fetus. Dr. Elliot Fishman supervised the procedure and saved the images as Digital Imaging and Communications in Medicine (DICOM) files. The original data has been archived at the SINMNH in Washington, D.C. The DICOM files from CT were imported into Mimics® 8.0 on a Dell Dimension 8400 desktop computer. Mimics® enabled the creation of segmentation masks to select specific areas of density. These were saved as discrete parts of anatomy and named and as exportable layers. Value thresholds were manipulated to select distinct target areas of data, such as bone, and then segmentation masks were created from each of these selections. For some structures, such as embedded teeth, contours were hand-selected with the Edit Tool in order to guarantee accuracy for surface models. Finally, the segmentation masks were saved and exported as high-quality stereolithography (STL) files. Each specimen was composed of three registered STL files: soft tissue, bone, and teeth. Autodesk 3D Studio Max® 8.0 was used to create digital 3D models. Registered layers of STL data were imported into 3D Studio Max® at full resolution for each specimen. In 3D Studio Max®, standard views of the structures were selected and a virtual photometric light apparatus was used to light the models and to highlight the important structures. A single color selection (R=247,G=229,B=206) was made for bone and teeth. Each of the 3D models was also rendered at 50% opacity. Because the STL data retains information on internal structures, reducing the opacity of a specimen’s model reveals embedded anatomy and cavities. At 50% opacity, hollow regions and channels appear darker in value than the surrounding bone. This process was used for each of the three specimens. The final renders were saved as Tagged Image File Format (TIFF) files at 300 dots per inch and Adobe Photoshop CS2® was used to adjust colors and compose final images. Photoshop® was also used to colorize discrepant parts of bony anatomy (Figure 2). QuickTime® movies of CT data for each of the three narwhal specimens were generated with files exported from Mimics®. JPEG files were exported from Mimics® and imported into Adobe After Effects® 6.5. Three consecutive film compositions were created for each specimen—axial, coronal, and sagittal—and the JPEG files were sequenced at 30 frames per second with QuickTime® Animation compression type. (See: Female.mov and Fetus.Mov). 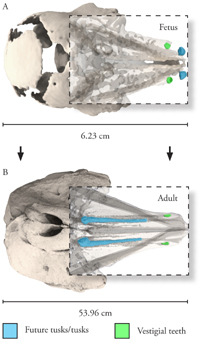 Digital 3D reconstructions of the three narwhal specimens provided an undisturbed view of the teeth and associated bony structures in situ. The skull of the fetus is 6.23cm in length and 4.96cm in width at the most distal points on its frontal bones. Calcification of major bones of the skull is incomplete, but most of the main membrane bones are present. This is not the youngest narwhal fetus recorded in the literature (Eales 1950). The maxillae are excavated antero-ventrally to form two conspicuous pairs of tooth sockets, or alveoli. Pre- and post-orbital processes are well developed in this specimen. Two pairs of teeth—future tusks and vestigial—are evident in the upper jaw. Both pairs are located in their respective sockets in the maxillary bone (Figure 3). The future tusks are located antero-medially to the vestigial pair of teeth. This investigation revealed that the future tusks move in a posterior direction during development and will form the two large tusks of the adult narwhal (Figure 4). Growth and development of the vestigial pair of teeth terminate later in development. The future tusks and the vestigial pair of teeth both exhibit asymmetry. The sectioned head of the female narwhal was 55.82cm in length and 47.90cm in width at its base. The skull of the specimen was 53.96cm in length and 35.08cm in width at the most distal points on its frontal bones. Like that of most cetaceans, the skull of this specimen was asymmetrical, and bony structures were skewed toward the left side of the head (Berta 2003). In digital 3D reconstructions, two pairs of teeth—tusks and vestigial—are visible in the upper jaw of the female narwhal. Both pairs are found in their respective sockets in the maxillae. The tusks are located postero-medially to the vestigial pair of teeth. In the female, the paired tusks typically remain embedded in the maxillae, as is the case with this specimen. The tusks are asymmetrical. Transparent 3D models reveal that sockets for the tusks in the skull begin at the bases of the teeth and terminate in the most distal part of each respective maxillary bone. Transparent 3D models also reveal previously undocumented sockets for the vestigial teeth. Sockets for the vestigial teeth begin near the bases of the tusks and terminate in the most distal part of the maxillae. Well-developed sockets for the vestigial teeth in the adult narwhal are significant, as they provide clues about the evolution of the modern dentition of the narwhal. The vestigial pair of teeth also exhibits asymmetry. The left tusk is 18.33cm in length and the right tusk is 17.47cm in length. In the adult female specimen, the right vestigial tooth protruded slightly from the bone. The presence of vestigial teeth in the adult narwhal is largely without extensive documentation in the literature, perhaps because the vestigial teeth may erupt from the bone and are easily lost during dissection and preparation. The sectioned head of the male narwhal was 62.33cm in length and 49.70cm in width at its base. The skull of the specimen was 57.24cm in length and 35.01cm in width at the most distal points on its frontal bones. Like the female narwhal specimen, the skull of the male narwhal was asymmetrical. In digital 3D reconstructions, two pairs of teeth–tusks and vestigial–are visible in the upper jaw of the male narwhal specimen. The paired tusks are located postero-medially to the vestigial pair of teeth. As is typical with the species, the right tusk remains embedded in the skull and the left tusk erupts from the left maxilla. Sockets for the tusks begin at the bases of the teeth and terminate in the most distal part of each respective maxillary bone. The vestigial pair of teeth also exhibits asymmetry. The left tusk is 89.62cm in length and the right tusk is 20.81cm in length. 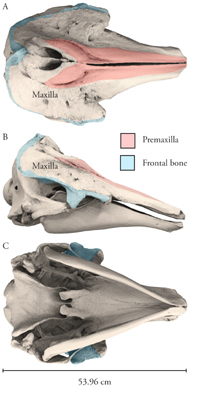 Digital 3D images reveal that, unlike the vestigial teeth of the female specimen, the vestigial teeth of the male narwhal are not embedded in bone; instead, they are suspended in the soft tissue lateral to the maxillae (Figure 5). A comprehensive visual record of the dental anatomy of the narwhal, M. monoceros, was created with CT data and digital 3D imaging via Mimics®. Digital reconstructions of the two adult specimen heads–male and female–and a complete fetal specimen revealed novel information on the dental anatomy of this animal. The first major finding was the presence of paired vestigial teeth in all three specimens. Although a previous study documents the presence of a few single vestigial teeth found in a small collection of adult narwhal skulls, no other known investigation has found paired vestigial teeth (Fraser 1938). The lack of prior documentation on vestigial teeth may be because the vestigial teeth are easily lost or damaged during dissection and preparation. In the case of the male narwhal, the vestigial teeth are not embedded in bone. Radiography and digital 3D reconstructions provided an undisturbed view of the vestigial teeth in situ. The second major finding was that changes occur in the positions of the two pairs of teeth–tusks and vestigial–in the maxillae during development. The two pairs of teeth reverse positions. In the fetus, the future tusks are located antero-medially to the vestigial pair of teeth at four-six months in development. The fully developed tusks are located postero-medially to the vestigial pair of teeth in the adult narwhal. Berta, Annalisa and James L. Sumich. Marine Mammals: Evolutionary Biology. London: Elsevier Science, 2003. Brear, K., J.D. Currey, M.C.S. Kingsley, and M. Ramsay. “The Mechanical Design of the Tusk of the Narwhal (Monodon Monoceros: Cetacea).” Journal of the Zoological Society of London 230 (1993): 411-423. Eales, Nellie B. “The Skull of the Foetal Narwhal, Monodon Monoceros.” Philosophical Transactions of the Royal Society of London 235 (1950): 1-33. Heide-Jorgensen, M.P. "Narwhal". Encyclopedia of Marine Mammals (2002). 784. Roberge, M.M. and J.B. Dunn. “Assessment of the subsistence harvest and biology of narwhal (Monodon monoceros L.) from Admirality Inlet, Baffin Island, Northwest Territories (Canada).” Proceedings of Canadian Fish and Aquatic Science Organization (1990): 1-32. Martin T. Nweeia, DMD, is a Clinical Instructor at the Harvard School of Dental Medicine, and a Research Associate in the Marine Mammal Program at the Smithsonian Institution. Dr. Nweeia is also Expedition Leader and Principal Investigator for Narwhal Tusk Research. He has a Doctorate of Dental Surgery from Case Western Reserve University, in Cleveland, OH, and a Doctorate of Dental Medicine from Case. He has a full time general practice in Sharon, CT.
Brent R. Whitaker, DVM, is the Deputy Executive Director of Biological Programs at the National Aquarium in Baltimore, MD. Dr. Whitaker has a Master of Veterinary Science and a Doctor of Veterinary Medicine degree from the University of Flordia, College of Veterinary Medicine. Charles Potter is the Collection Manager, Marine Mammals, at the Smithsonian Institution National Museum of Natural History. He has a Bachelor of Science (Zoology) from SUNY College of Forestry and Environmental Science. Timothy H. Phelps, Associate Professor in, and Assistant Director of the Department of Art as Applied to Medicine, Johns Hopkins University, School of Medicine, Baltimore, MD. Elliot K. Fishman, M.D., Professor of Radiology and Radiological Science and Professor of Oncology at Johns Hopkins Hospital, Baltimore, MD. Gary P. Lees , MS, CMI, Associate Professor, Chair and Director of the Department of Art as Applied to Medicine, Johns Hopkins University, School of Medicine, Baltimore, MD.